The MFC framework is a powerful approach but using it impacts the design of the application, it's very intrusive and we have to be careful of how we use it. 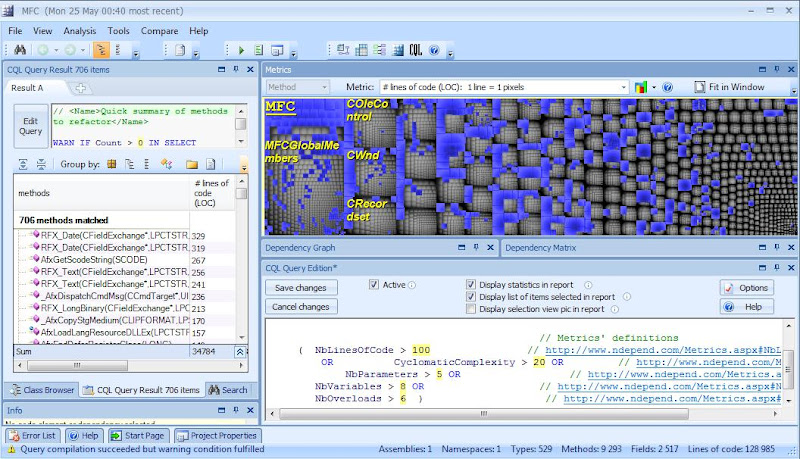 Let's analyze MFC8 with CppDepend to discover its code quality and design. CppDepend is a tool that simplifies managing a complex C++ code base. Architects and developers can analyze code structure, specify design rules, and plan massive refactoring, do effective code reviews and master evolution by comparing different versions of the code. 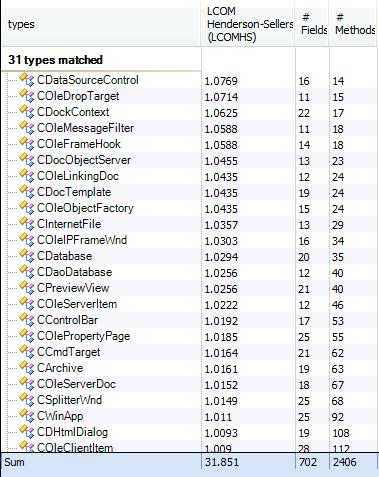 CppDepend supports the Code Query Language (CQL) for maximum flexibility. Basically CppDepend considers your code as a database and you can write some CQL statements to query and check some assertions on this database. As a consequence, CQL is similar to SQL and supports the SELECT TOP FROM WHERE ORDER BY pattern. 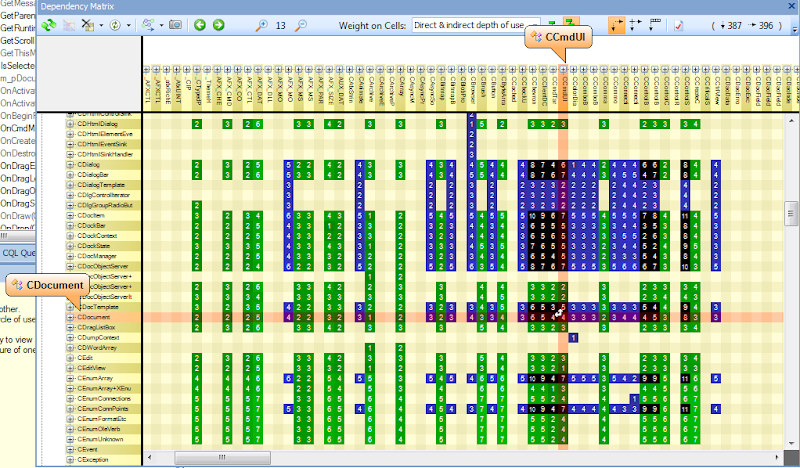 With CppDepend we analyze the quality of implementation and also the design of MFC. A quality of implementation is important for developer who debug inside MFC,indeed not all things work as we like and sometimes we have to look inside the library code so if it's not well implemented it complicate the task when debugging. A design of MFC is very important for developers because it impact the design of the application because it's very intrusive. 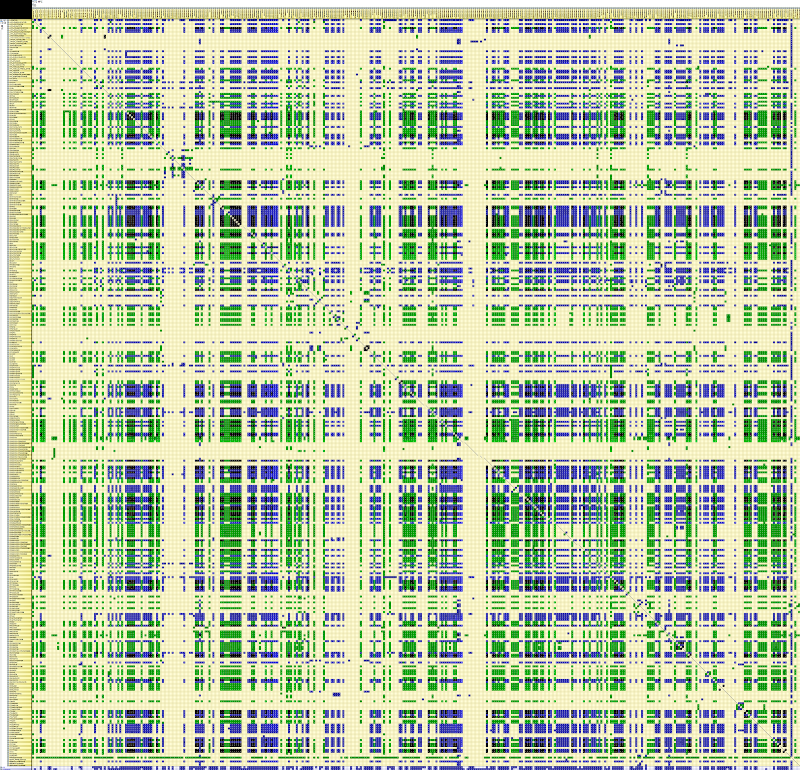 The blue squares represent the result of the query, so almost 50% fields don't begin with m_". So 706 methods are candidates to refactoring, but the request can be changed, it's depending on the choice of the complexity criteria for each team. Let's see if all complex methods are commented. The namespace is an important concept to design application, it isolates functionalities under a module and provides a logical grouping, it can also make a library simple to use. Unfortunately MFC don't contain any namespace in spite of the existence of different functionality (GUI, OLE, Database, Containers ...). 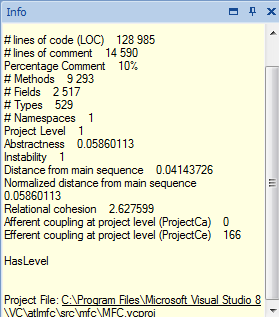 The screenshot below showsthat the 2 classes CDocument and CCmdUI are involved in a cycle of minimum length 5. The efferent coupling for a particular type is the number of types it directly depends on. 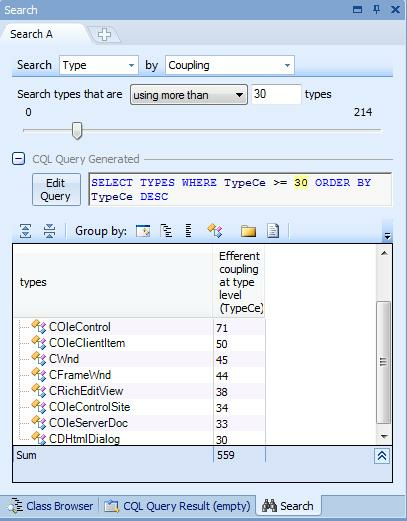 Types with high efferent coupling are more complex than others,CppDepend propose a search panel, it's like a wizard that help you construct query easily. Let's search for Types where efferent coupling is more than 30. In dependency graph CDocument and CView are mutually dependant and usually the model don't have to know the View and it must be independent of any external framework. The goal is to reuse the same model in different projects (Console, Gui, WebService, ...) and if our model is the CDocument we can't reuse easily in other projects. CDocument can be used also as COM Component, but CDocument is coupled with CView and using CDocument as COM component can occur some unexpected limitations and problems. When we instantiate a CDocument as COM Component a handle of view is created due to the coupling Doc/View so the number of instances to create is limited by the number of window handles that can be created, and the problem occur particularly if the instances are created in a no desktop session, in this case the number of handle that can be created is very limited by default. Use or don't use MFC? MFC is well implemented but not really object oriented and the classes are high coupled, so be careful when using it and avoid any unnecessary coupling,for example prefer using ATL for COM component and STL for containers. It's preferable to avoid as possible the coupling of your model with Doc/View concept, it make your design less flexible and add more complexity. Human resources department don't need to spend a lot of time to search for MFC gurus; maybe just few MFC developers will be sufficient. Developers don't add a compleB7 Developers don't add a complexity of a framework to the complexity of what's they implement. Reusing easily the business layer in other context (Web Services, Console, ...). So keep it simple and isolate the impact of any technical framework used, for that be careful for any unnecessary coupling.